Digital advertising is a very competitive market, and both brands and advertisers face many challenges when developing their marketing strategies. Creative thinking and grand ideas are not enough to succeed in the digital advertising industry, but Whichit may just be the solution advertisers need to overcome the barriers they face each day. Display ads have been around for years, but they still follow the same formats and haven’t advanced alongside technology to keep users interested. As a result, internet users have become desensitised and the ads fade into background noise that they’re able to simply ignore. Whichit’s ads are image-rich, fun and engaging. They gamify the display ad experience, adding interaction where the user least expects it. They appear as addictive and entertaining content in the form of quizzes, surveys and polls. Users find the style of these ads so appealing that they see a click-through rate 40 times higher than that of traditional banner ads. In 2017, 615 million devices were using ad blockers, and this is a figure that’s constantly on the rise. In 2015, the high ad block download rates caused a staggering £22 billion worth of damage to advertisers, and publisher revenues also suffered. Whichit’s interactive ad units can be shared or posted anywhere on the web, and they are not targeted by ad blockers. This means that brands and advertisers can reach a huge audience they would otherwise miss when using traditional display ads. Brands and publishers are sometimes left drowning in meta-data and it can be an exhausting task to flesh out the relevant data from the irrelevant. As a result, they are unable to target their users effectively. Whichit’s interactive ad units gain actionable insights and provide a unique way of targeting users by their preferences. The system can be easily integrated into any 3rd party CRM or Data Management Platform, streaming all data points to improve clients’ performance and targeting capabilities, and is completely GDPR compliant. Whichit combines the brightest minds and most sophisticated technologies to create ad and marketing solutions that recapture the users' attention in an unobtrusive manner, making them WANT to engage with YOU. Founded by three professional Israeli entrepreneurs, Whichit relocated to London after winning the UKTI's Sirius Programme in 2014. In 2015, Whichit then went on to win 'Start-up of the Year EMEA' by Facebook, the Innovate UK R&D funding award, and the People's Choice Award at Pitch@Palace by the Duke of York. Birchbox is the UK's number 1 beauty subscription service. They launched a Whichit campaign on their website in 2016 to increase brand awareness and drive sales. Their Whichit quiz saw over 24,000 unique views, 113 social shares, and an 89% engagement rate, with 97% completing the quiz and a 31% Call-to-Action rate. Birchbox's audience loved the interaction and it was so successful that Birchbox have created 8 Whichit campaigns to date. Birchbox achieved 97% Completion rate and 89% Engagement rate in just 10 days thanks to Whichit. Click to read full case study. 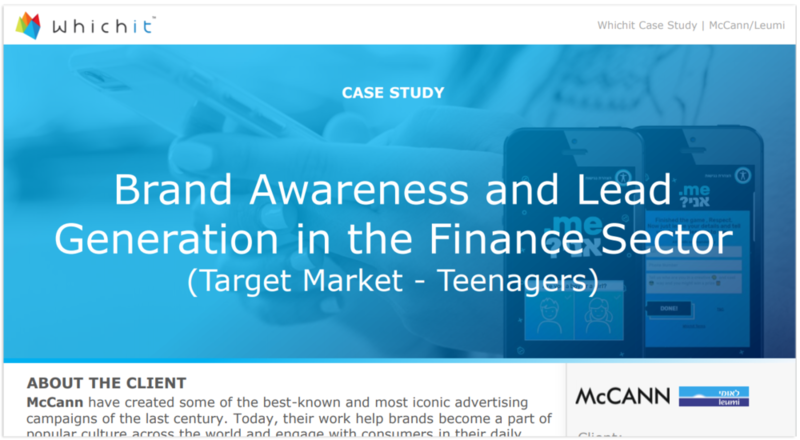 Earlier this year, 2018, Leumi Bank teamed up with McCann to increase awareness of their new app for teenagers. With an 11-day Whichit campaign, they obtained over 14,000 unique impressions with an impressive 98% engagement rate. Discover how 'Leumi' delivered within 11 days over 98% Engagement Rate, 91,500 Total Interactions, and 95% Completion Rate, using Whichit for their campaign. Click to read full case study. Infirst Healthcare used an 8-question Whichit quiz to promote a new pharmaceutical product, Flarin, to relieve rheumatic or muscular pain and mild arthritic conditions. The quiz was advertised on Facebook and shared on the ‘Joint Flare-up Network’, a community forum page on Facebook. The campaign ran for 28 days and saw 15,335 unique views with a 73% engagement rate, 28.5% Call-to-Action rate, and they collected over 2,300 email addresses. Considering the mature age of their target audience, these figures are very impressive. Flarin's Whichit Quiz delivered a phenomenal engagement rate on Facebook, X40 higher than the average benchmark of Health and Beauty Industry engagement. Click to read full case study. Whichit has seen success across all different verticals, including automotive, travel, entertainment, insurance, gambling, retail and fashion. Don’t just leave the success to them. Take your marketing strategy up a notch by implementing a Whichit creative for your next campaign.